Wyken is a 1200-acre farm which includes a flock of Shetland sheep, a small herd of Red Poll cattle and a 7-acre vineyard producing award-winning wines. It is located just outside Walsham-le-Willows, just off the A143 between Ixworth and Stanton. The 400-year-old barn houses the Leaping Hare Restaurant and Café, which are both open every day for lunch, afternoon tea, and dinner on a Friday or Saturday evening. The Elizabethan Manor house is surrounded by beautiful gardens, which are available to visit from Easter to September every afternoon except Saturdays. Every Saturday there is a farmer's market from 9am until 1pm. The woodland walk is free to explore and leads to the enormous vineyard, which stretches as far as the eye can see across the fields. When we arrived at the end of the drive, we were greeted by a very friendly white donkey and a beautiful black horse, who were very happy to be patted. There is a gorgeous avenue of trees, surrounded by daffodils in the spring, which leads to the barns. Across the field, which has some marvellous fallen trees begging to be clambered on, is the entrance to the ancient wood. It has rough paths, which get quite boggy when it has rained, but would be fine for an all-terrain pushchair. There are examples of most British woodland flora in abundance. 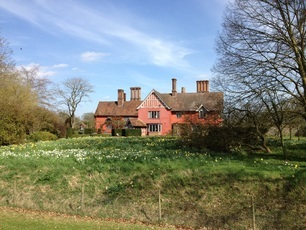 The undergrowth was alive with primroses, celandines, violets and anemones on our first visit. There are plenty of birds, bees and butterflies to delight small adventurers. The barn complex consists of the restaurant and Café on one side, and a spacious country store on the other. The toilet facilities are very baby-friendly, and even contain free nappies and wipes!! The shop has a whole section dedicated to children's gifts and toys and a variety of books, clothes, gardening and kitchen equipment, and soaps and candles. Most of the items they sell are locally sourced. The Café serves teas and coffees, cold drinks and a bistro-style menu. The cakes were lovely, and included a gluten-free orange cake, which was happily devoured by Amelia and me! We sat outside in the sun, where we could see chickens wandering around and could see the gardens. Although we did not go into the gardens on our last couple of visits, they look well worth the small entrance fee. They are beautifully maintained formal gardens, with a brood of peacocks, guinea fowl and turkeys roaming freely. I will update this when I have explored it myself!